Got time on your hands? Check out the exhibits at the American Clock & Watch Museum, 100 Maple Street, and learn how the American Industrial Revolution began. When you walk in, the first thing that you see is an original sign for Daniel Burnap’s clock shop. His "shop" contains the tools that were used for clock making: lathes, cutters and dividers for cogwheels, and rollers for inserting bearing stones and sticks. This exhibit grabs your attention right away. Burnap was the tutor for Eli Terry. By pressing a button you get to hear "Eli Terry" when he was fourteen working as an apprentice to Burnap. Eli Terry is probably a more recognizable name today because he revolutionized the clock making industry. Terry came up with the idea of interchangeable parts and thus started the American Industrial Revolution in 1792; he figured that if parts were made uniformly, "unskilled" workers could each produce a single part of a clock – the assembly line was born! Those pieces could fit easily together, thus making it possible for clocks to be made more cheaply and more quickly than ever before. As you turn the corner from Burnap’s clock shop, you hear how clocks were sold in the early days of the industry. Again, just push the button! This time a "Yankee peddler" talks about his life selling clocks door-to-door. He teaches you some of the tricks that were used to sell his wares to frontier settlements: throw in a comb or another trinket to entice the customer to buy a clock. Once you leave the peddler, you are greeted by an original clock gear assembly station from the old Sessions factory in Forestville. Then a TV shows a three-minute video clip of workers at their machines in the Ingraham factory in Bristol. Ingraham made Oriental and mosaic clocks that could be made quickly and sold for cheaper prices, making clocks affordable for everyone. While the tour is virtually complete, there is another section that needs your attention: a display that presents the history of clocks which shows how timepieces have evolved and improved over the years. The American Clock & Watch Museum definitely keeps your attention – true to the expression that time flies when you’re having fun! But, before you leave make sure that you take a look at the gift counter where you’ll find books, pens, pins, etc. – all having to do with clocks and watches. Well, time’s up! 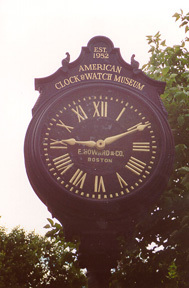 American Clock and Watch Museum – visitation: 3/13/00. American Clock and Watch Museum: http://www.ubr.com/clock/museum/ocwm/acwm.html. An Overview of the American Clock and Watch Museum: video. Clock-making: Production in U.S. Encarta Encyclopedia "98."